Shireen S. Rudina ’13 of the MIT Parliamentary Debate Team debates the ethics of eating meat with PETA Vice President of Policy Bruce Friedrich. The two presented their opposing arguments Monday night to a packed 10-250. Not surprisingly, neither was convinced to concede the point. Bruce Friedrich, the vice-president of policy and government affairs for People for the Ethical Treatment of Animals (PETA), debated the ethics of eating meat with the MIT Debate Team on Monday night in 10-250. Shireen S. Rudina ’13, the debate team’s vice president of tournaments, argued against Friedrich’s proposal that eating meat is unethical under all circumstances. Forty-five teams competed for $15,000 last night in the final round of MIT’s Innovation, Development, Enterprise, Action and Service (IDEAS) Competition, spelling out their vision to make the world a better place. The annual competition focuses on innovation in the realm of public service. Teams entered projects in fields ranging from health care and education to food production, with many focusing on the challenges of world poverty and international development. 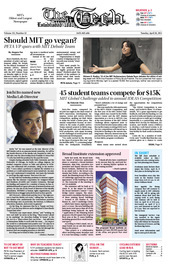 Joichi “Joi” Ito was named as the new director of the MIT Media Lab in an announcement yesterday. He will be the fourth director of the Media Lab, founded in 1985. Ito will take over the directorship from Franklin H. Moss PhD ’77, who has held the position for the past five years. Early last week, the Broad Institute Board of Directors authorized plans to construct a Broad Institute extension. Alan Fein, executive vice president and deputy director of the Broad Institute, delivered the news in an email sent to the Broad community last Friday. According to the email, the Planning Board of the City of Cambridge approved the external appearance of the building on April 12. The transcript of the meeting is not yet available. Arts was not published this issue.